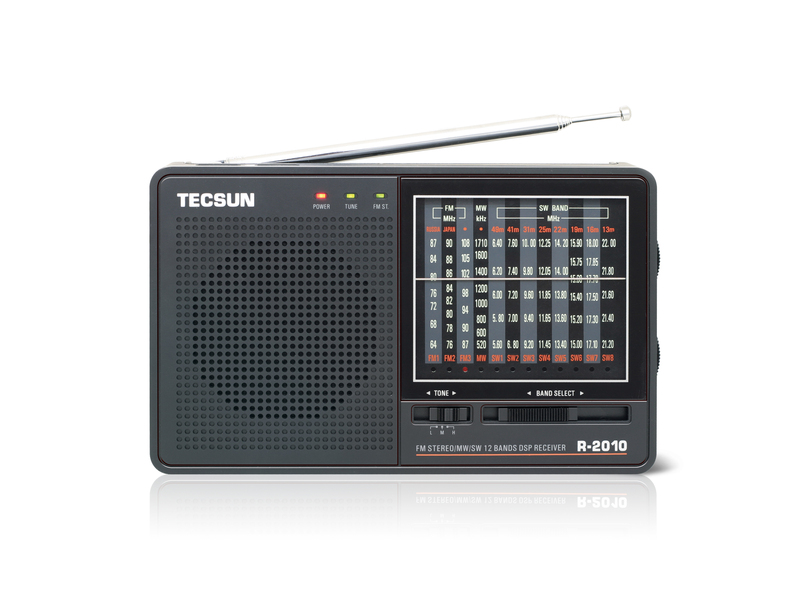 The Tecsun R-2010 is a new (unreleased) analog portable receiver and the first to use the new Silicon Labs’ Si4831 AM/FM receiver ICs. The R-2010 is a 12-band, analog (i.e. wheel-tuned) DSP radio, which offers FM stereo, medium-wave (MW) and shortwave (SW) reception. Update: Reliable sources have told me that Tecsun may be re-designing the R-2010 with a digital display. This is unconfirmed as there are no prototypes or designs available, however, this could be a very good response to feedback from other DSP analog radios like the Degen DE321(namely, that digital tuning is precise, but the analog display is vague). This may also explain why the R-2010 has not been released even though Tecsun has had it in the works for almost a full year. I wonder if the new model would implement the Silicon Labs Si484x chipset (thanks, Mike!). The Tecsun R-2010 has not yet hit the market at time of this posting, but we will update this page and review the receiver once available. Click here to read the full press release of the Si483x and its use in the Tecsun R-2010. Click here to read an additional SiLabs update to the press release. This entry was posted in Analog, Portables, Tecsun and tagged R-2010, Si4831, Si483x, SiLabs Si4831, Silican Labs Si484x, Silicon Labs Si4831, Silicon Labs' Si483x, Tecsun, Tecsun R-2010, Tecsun R2010. Bookmark the permalink.